On the day Leigh Centurions were presented with the League Leaders Shield, they showed just why they have been the best side in the Championship this season at a wet and windy Leigh Sports Village. Centurions, who will now go on to challenge for a place in Super League in the forthcoming Middle Eights, put the lowly Dons to the sword for the second time this season though they were made to work harder than expected at times in the first half. 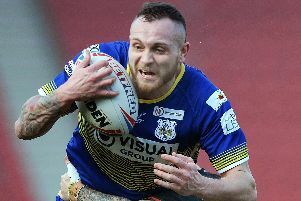 Lacking three regular props, the Dons gave a starting debut to midweek loan signing from Featherstone Ryan Verlinden. The Dons made a useful start but fell 10-0 behind after as many minutes following well-worked tries by wingers Liam Kay and Adam Higson, the latter converted by stand-off Martyn Ridyard. If Leigh fans expected the floodgates to open they were in for a shock as Gary Thornton’s side dug deep to stem the tide despite coming under severe pressure at times. Playing with more structure in attack than when being nilled by Halifax, the Dons stunned the home side by opening their account with a 32nd minute unconverted try by winger Peter Fox from an astute grubber-kick by Mennell ten metres out. Full-back Gregg McNally also crossed for another converted try before the break to leave the Dons trailing 22-4. Dons made the early running after the break and had Leigh on the back foot at times before conceding three long-range tries in quick succession – the first of which was an 80 metres interception by Ryan Brierley on 48 minutes – to make it 40-4. Gareth Hock touched down from a storming run on 58 minutes. The Dons continued to try and play football and would have grabbed a second try had LotoTagaloa not knocked on from Kyle Kesik’s grubber-kick over the line. Leigh rode their luck and Ridyard added a converted try to make it 52-4. Kay completed his hat-trick following another Leigh interception. Centre Liam Welham touched down from close range five minutes minutes from time with Naughton adding the extras but Leigh replied with two late tries by Ben Reynolds, who spent time on loan at Doncaster earlier in the season, and Kay. Leigh: McNally; Higson, Worthington, Pala,Kay;Ridyard, Brierley; Acton, Higham, Emmitt, Dixon, Goulden, Hock. Subs: Reynolds, Wilkes, Barlow, Aspinwall. Dons: Naughton; Scott, Cowling, Welham, Fox; McLocklan, Mennell; Verlinden, Kesik, Clark,Kelly, Musolino, Emmett, Subs: Wright, Carbutt, Tagala, Foster.